Health care reform has generated heated political debate in the United States. While the reform stands as one of President Obama’s most important first term achievements, it also remains one of the most controversial. Implementation of the Affordable Care Act has met major roadblocks as the online health insurance exchange marketplace continues to have technical difficulties since opening in early October. Furthermore, the administration’s promise that existing health care plans will not change appears unlikely. 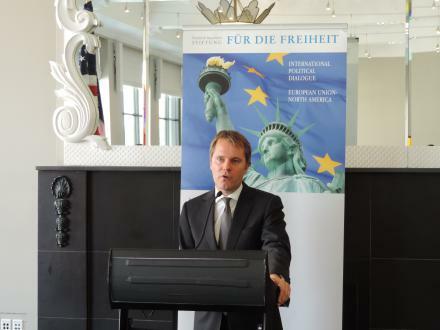 Given this climate of reform and controversy, the Transatlantic Dialogue Program of the Friedrich Naumann Foundation for Freedom hosted a timely event featuring the current Federal Minister of Health, Daniel Bahr, regarding the German health care system and the challenges it faces. 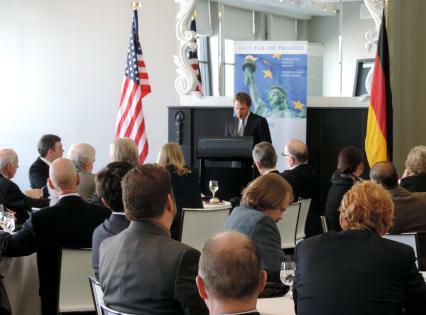 Bahr began the event by providing the audience with a general overview of the German healthcare system. The German social security system has a long tradition spanning 130 years – a fact that many Germans take for granted. Yet, despite this long history, the German system also faces major issues. In 2009 the Christian-Liberal Government in Germany faced the difficult and unpopular task of reforming the healthcare system to place it on a sound and sustainable footing. When the German health care system underwent reforms in 2009, less than 300,000 people were uninsured. In order to cover this small hole in the health care system, insurance became mandatory for everyone including the self-employed. Insurance under the mandatory system is provided by 134 health insurers that include non-profit and private agencies. About 90 per cent of the insured persons are insured under a statuary insurance and 10 per cent are privately insured. The German health care system is thus dominated by the public sector, but not government-dominated. Additionally, Bahr noted that a large part of regulatory decisions are delegated to self-governing bodies within each healthcare provider and insurer. These nuances are important to understand as they are often overlooked in the United States where the debate only compares public versus private healthcare options. The Minister underlined that the insured have freedom of choice in the German system as they can choose their primary care physician as well as their consulting physician and specialists. Reforms introduced in recent years have created more flexible conditions within basic benefit options. Elements of competition within a system that is “fundamentally based on solidarity” create more freedom of choice for the insured while simultaneously promoting efficiency and quality of care. From 2000 to 2010 health care expenses have only risen by 2% on average annually. Ultimately, the German health care system combines three main aspects according to Bahr: Solidarity, Competition and Efficiency. However, despite this positive diagnosis, the German health care system continues to face serious challenges. As the number of elderly increases so too does the rising demand for care. Discrepancies in the availability and quality of healthcare resources nationwide also imply inefficiencies within distribution. Inefficient care causes unnecessary costs that could be easily avoided. Bahr also noted the appearance of ‘Pseudo-Innovations’ that cause additional costs without adding value. In order to meet these challenges, the CDU/CSU and FDP coalition passed multiple reforms during their last government. Before the reforms, the statutory health care system’s costs had risen more than its income for years. In addition, health insurance contributions were tied with wages until 2010 resulting in rising contribution rates paired with the rising labor costs. Cyclical fluctuations also led to significant losses of revenue for insurers. In order to meet these rising costs, non-income related contributions and social subsidies from public funding were put in place. This new act put the health care system on a solid foundation. 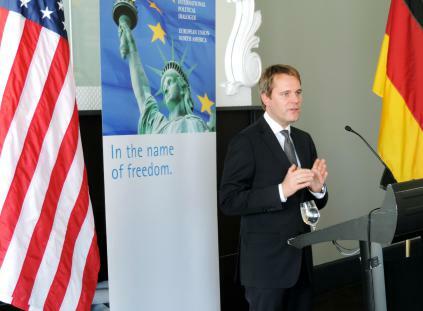 According to Bahr, the surplus of statutory health insurances will amount to 30 billion Euro by the end of the year 2013. Reforms also extended to the pharmaceutical market where innovation and affordability often come at odds. Now, direct negotiations between pharmaceutical manufacturers and health insurance providers ensure that drugs are priced with the benefit of the patient in mind. The Minister outlined that in some regions, especially rural areas, not enough doctors are available. There also exists a shortage of nurses and care attendants. Improvements within the structure of health care within the statutory insurance drives measures to provide satisfactory and extensive medical services. These measures are complemented by a series of individual restructuring in the areas of vocational training and “work-life balance“ in health professions. Bahr also emphasized the importance of prevention and actions to promote a healthy life style. Prevention and health promotion provides short run benefits and major savings in the long run. A draft bill to solidify these issues, however, failed to obtain the majority of votes in the Bundesrat. The Minister now hopes, that the issue will remain on the agenda of the new government.